With its location near the very centre of the Golden Horseshoe, Burlington’s economy is constantly growing, and area businesses have the added benefit of operating out of a city recently named the second best in all of Canada. But with all of that growth and positive press comes quite a bit of pressure, too, as more and more companies try to take their slice of the Burlington pie. If you want to make sure that your business thrives, you need to make sure that your office space is designed with the specific goals of your company in mind. At Alliance Interiors, we work with our customers to create “business environments that make sense.” That means you’ll get a professional, visually-appealing space that will be sure to wow clients while also never losing sight of employee comfort and productivity. Only when your work environment is the best that it can possibly be will your company reach its full potential. Maybe you’re wondering whether your office really needs an upgrade. After all, things have been working out just fine for years – why spend money to change them now? The problem with this kind of thinking is that it doesn’t allow for the possibility of something better. How might your company benefit from a remodel from Alliance Interiors? Improved communication. If your office suffers from a poor layout, communication issues are almost guaranteed to arise. Maybe you started out with only a few employees, but continued growth has put people almost literally on top of each other or placed two groups that need to work closely together at opposite ends of the office. We can help you at the planning stages to make sure you fix these issues now and into the future. Increased productivity. When it’s easier for your employees to work together and focus on the task at hand instead of getting waylaid by distractions, that means an increase in productivity for you. Adding in a few ways for your staff to relax can help this, too, since they’ll be able to recharge during breaks and head back to work energized. Give a better impression. For some companies, such as those in the tech field, it’s important to regularly update your look so that potential clients and hires see you as being at the forefront of the industry. Law firms and others don’t have this issue, but that doesn’t mean a remodel won’t help them if their current office space feels messy or cluttered. Alliance Interiors knows that the goal should always be to present the proper image for your specific industry. Lifts morale. Most employees aren’t going to get excited about coming to work in a place where the design and furnishings in their workspace are from a generation ago – or more! Faded couches and uncomfortable chairs just don’t encourage people to look forward to. By updating your office’s look and investing in high-quality furnishings, you’ll make your employees proud to walk in the door in the morning, and this is something that tends to translate to the effort that they put into their work and the way that they perceive your company. Decreases health issues. Beyond making them happier to come to work, opting for ergonomic chairs and desks and redesigning your space to encourage breaks can go a long way towards keeping your workforce healthier. That means fewer days where people call in sick and less visits to the doctor – things that directly impact your bottom line. So, how exactly can Alliance Interiors help your business? We offer a full array of office interior services that are designed to meet the needs of companies big and small. Home Office Design Services. Burlington’s constantly-growing economy makes it a great place for entrepreneurs and small businesses to get their start. Often, that start happens in a home office. Some people don’t think they need a design agency to help them to create a professional work space at home, but it’s not always as easy as it seems. Not only do you want to be able to work in comfort, you want to be able to minimize the many distractions that come along with being at home. And you probably want to match your home’s design aesthetic as much as possible. We have experience doing this in all kinds of homes. Office Furniture Procurement. Looking for that perfect desk and chair to go in your home office? Trying to outfit a workforce with high-quality ergonomic furniture to bolster productivity? 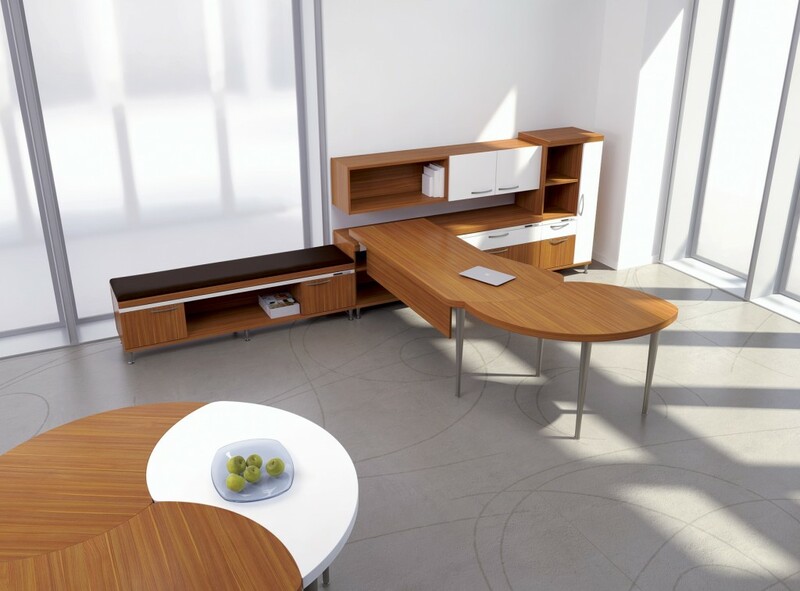 Alliance Interiors prides itself on working with globally sustainable Canadian furniture brands that specialize in professional office furniture that looks and feels good. Office Project Management. Where do you begin when trying to plan a remodel? Most people who haven’t been working for years in the interior design business don’t really know, but with Alliance Interiors you don’t have to. When you decide to work with us, we’ll set aside time to sit down an plan everything out – including a budget, a timeline, and an overall remodeling plan. Office Space Planning. If you’ve ever attempted to make a seating chart for a wedding or another large event, you know just how difficult space planning can be. And that’s only for a one-time thing – imagine trying to figure out how your office should look every day from now on! Lots of business owners are terrified of moving everything around in their office because they don’t feel confident that they can make the best decisions on their own. But with us you’re never alone. Our vast experience will help you to decide on the best possible layout so that you can make your employees happier and more productive. Office Interior Design Services. Redesigning your office with us can help you to increase efficiency, raise morale and productivity, and impress new clients. Best of all, we’ll make sure that we come up with solutions that fit both your space and your budget. Corporate Office Relocations. Moving? That’s okay, we can help with that, too. It doesn’t matter if your Burlington business is going across town or just down that hall – our moving team will facilitate your transition and ensure that the disruption is as small is it can possibly be. Remodeling your business is a big decision, and not one to be taken lightly. That’s why we’d be happy to talk to you about it further and help you decide whether or not Alliance Interiors is right for you. More businesses in Burlington are choosing us every day to help with their office remodel or design project. Discover why by contacting us today and helping your company to realize its full potential.